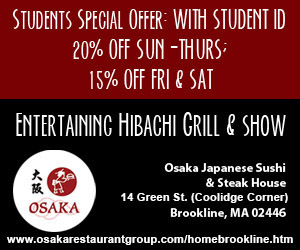 If laughter is — as the saying goes — the best medicine, Boston University’s comedy community certainly knows how to write the prescription. The diverse selection of BU student comedy organizations — be it a sketch group, improv troupe, stand-up club or satire publication — delivers frequent and potent doses of chuckles, cackles and squeals of glee. Thanks to performance showcases like Sunday’s Ha Ha Central and last Friday’s Hasan Minhaj performance, one need only find a seat to find themselves laughing along. But, perhaps even better yet, the abundance of opportunities to explore and practice comedic performance gives students their own chance to crack jokes on stage or online. 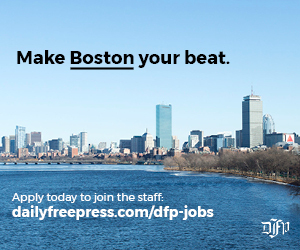 For Jay Leno aspirants and Upright Citizens Brigade hopefuls alike, BU gives students the chance to hone their craft — and to feel welcomed in doing so. 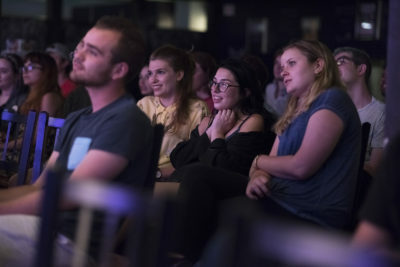 The BU comedy community is “super welcoming … there’s really a lot of effort to be a community,” said Karli Marulli, a junior studying film and television in the College of Communication. Her name may be familiar to those who saw her open for Hasan Minhaj last Friday and for Michael Che in March. Marulli is also a performing member of Liquid Fun, editor-in-chief of The Bunion and president of BU Stand-Up Club. Marulli said she won BU’s Funniest Finals competition in March, adding that the performances were “a lot more fun” than she anticipated. Marulli also noted that the larger audience at Michael Che’s and Hasan Minhaj’s performances were “super receptive” to stand-up comedy. It was a stark contrast to the “more intimate” setting of Flat Waffle Comedy Hour, which she co-hosts with Adam DeAngelo, a senior in COM, in BU Central, in the basement of the GSU, on a biweekly basis. She also said that she was grateful for the opportunity to perform onstage after being judged by her peers, calling the experience validating. 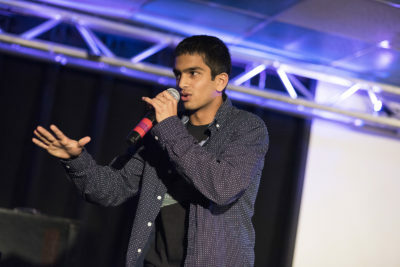 Aranya Tatapudi, a junior in the College of Arts and Sciences and a performing member of The Callbacks, echoed the sentiment of peer validation and critical collaboration. Student comedy groups are “able to compliment and critique each other,” she said. Tatapudi also performed at Ha Ha Central on Sunday and emphasized the abundance of opportunities available for aspiring comedians at BU. 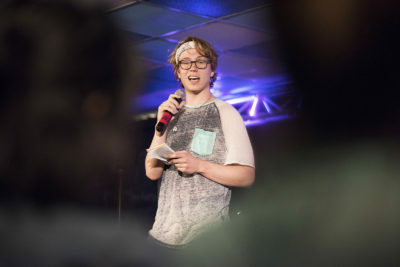 For Chris Bunting, a sophomore in the College of Arts and Sciences and regular attendee of Liquid Fun’s Sunday open practices, there are benefits to involvement in comedy at BU beyond the chance to perform. Prior to coming to BU, Bunting said he wasn’t very familiar with comedy as an art form. “I first really discovered improv comedy … when I saw Liquid Fun at orientation,” he said. Jason Sanchez, a COM senior and fellow member of The Callbacks, encouraged students to take a hack at eliciting hoots and hollers. “If it makes the community stronger, we’re better for it,” Sanchez said. Condon, also a writer and editor for The Bunion and a stand-up comedian, noted that the “community aspect” of comedy at BU was valuable personally and professionally. “Meeting with people you work well with” is beneficial to those interested in creative professions, Condon said, adding that she has already enjoyed collaborating with others on various projects. Jordan DeFilippo, a COM junior and another Slow Children at Play performer, elaborated upon the supportive environment Condon mentioned.